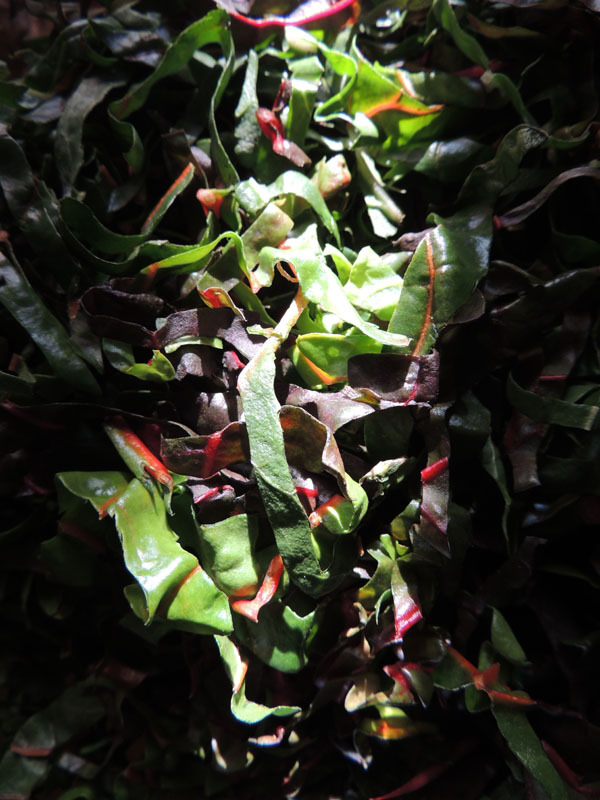 If using lardons, place in the pan with no oil – the lardons should release enough fat that can be used for cooking. Cook the lardons until crispy, then remove from the pan and set aside. If you are not using meat, then add some olive oil to a hot saute pan, and continue from here. Add shallots and garlic to oil – cook over medium-high heat, but make sure not to brown too much, to keep the flavors more mellow and sweet. 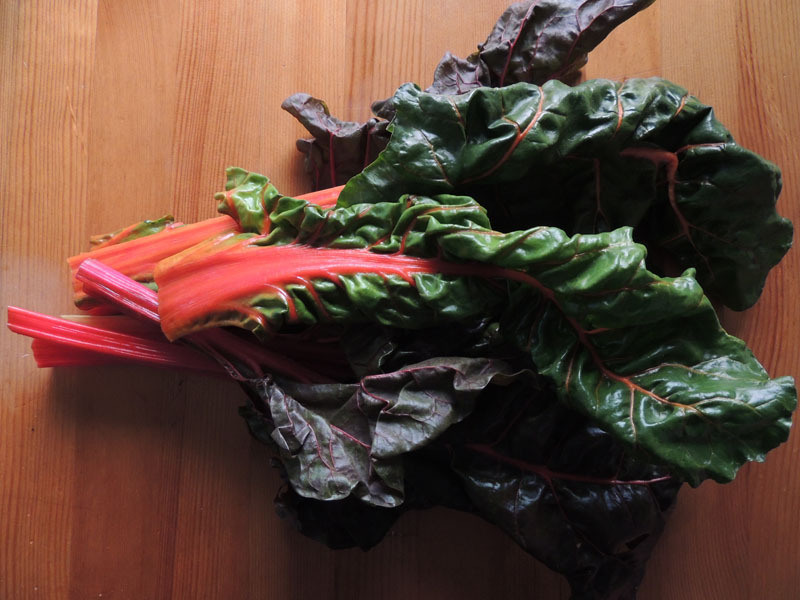 Then add your chard ribbons and toss with shallot-garlic mixture. Add a little bit of your liquid and keep tossing the greens until they are cooked (add liquid as necessary to keep from scorching). Then season with salt and pepper, but be cautious with the salt as you will be adding cheese later. Remove from heat and let the mixture cool for a bit, then fold in the ricotta and parmesan, and chopped cooked lardons, if using. Taste your mixture, to make sure it is seasoned enough, and then get ready to make your ravioli. 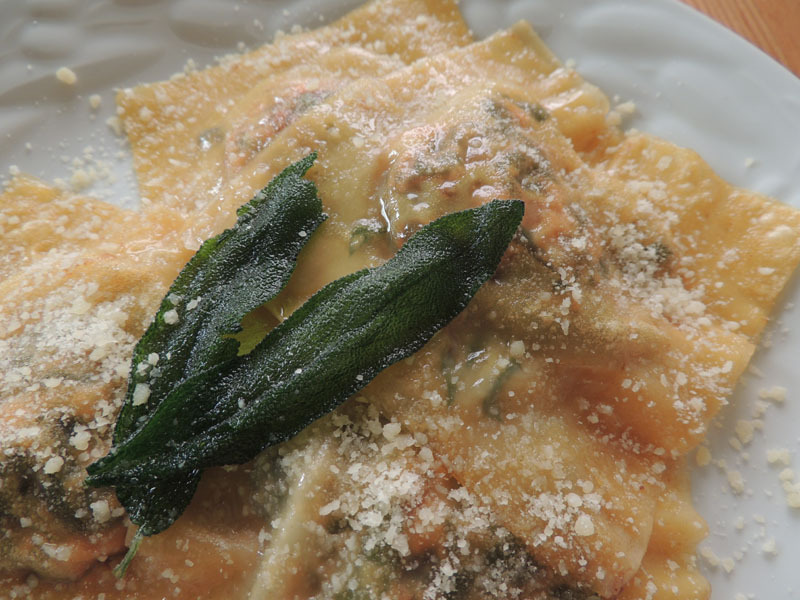 The first time I made chard ravioli, I decided to roll my own pasta dough and everything….by hand. Unless you are a trained chef or an Italian grandmother, rolling out pasta dough is no ordinary feat, and getting it to the thinness required seems a Herculean task. I’m not exaggerating here. I thought I had made it thin enough, and then when I went to cook it, it was like a hockey puck. In this version, I took the advice of Martha Stewart and used pre-made wonton wrappers. They are basically egg pasta and make excellent ravioli skins. To form the ravioli, you can do one of several things – you can use 2 sheets per ravioli (this is what I did in the main photo), making large ravioli that you can serve 1-2 at a time as a starter. 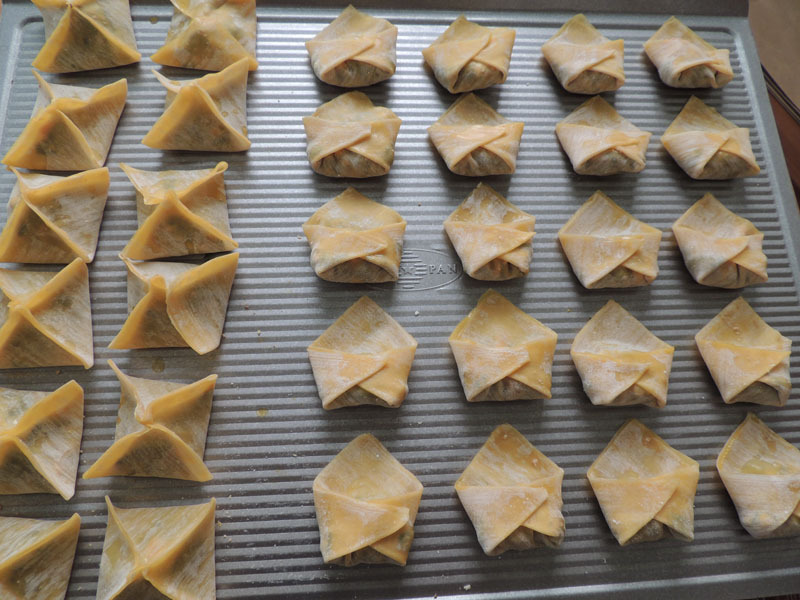 The other two ways I formed them are in little pouches (on the left) – somewhat labor intensive, but pretty if done correctly; and a traditional Sichuan wonton fold on the right (very easy). Since these are fresh pasta skins, you don’t have to cook them for very long at all. Bring some salted water to a boil and gently drop the ravioli in and boil for about a minute. Drain before adding to the sauce of your choice – I have done white wine butter sauce or red sauce, but my all time favorite is the sage butter sauce recipe below. This is the simplest sauce ever – just melt butter in a saucepan, and gently fry the sage leaves in the hot butter for about a minute. Toss pasta with this sauce and sprinkle with parmesan.